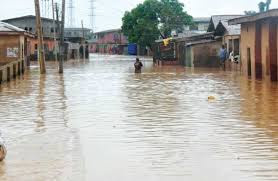 Benin – Residents of flood ravaged Obakhawaye street in Benin metropolis have appealed to the Edo government to urgently address the recurring menace. A trader, Esosa Osayuwa, who have a shop on the street, said the area had been in a terrible state for many years. Osayuwa said that during the rainy seasons, some residents do build canoes as means of transportation to access their houses. Omoye said years ago, some persons lost their lives while property worth millions was swept away by the flood after a heavy down pour. Omoye noted that the flood was a collection of water from link roads such as Oluku, Isekheri, Olotan and Uselu. Mr Lucky Isime, another resident, said that the congestion on Obakwawaye street contributes to the flooding of the area.